You'll want to cuddle up with hot cocoa! Great for a holiday or winter event. All you need is double-sided tape. This peaceful winter scene will make you want to cuddle up with a cup of hot cocoa! Tranform any room into a winter wonderland in an instant. Insta-View easily adheres to any smooth, flat wall with double-sided tape, sold separately. Measures 3'2" x 5'2". What? December and no snow! Well we can pretend! Since we haven't had a snow yet and it's December we thought this might add to our Christmas Spirit and pretend it's a snowy and cold day. We created a cozy little corner with the 'Winter Scene Insta-View and Stand-up Paper Fireplace. 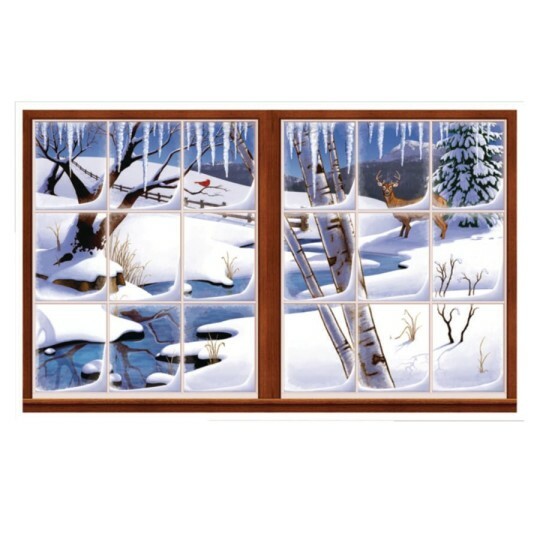 These scenes really brighten up our room and fit our winter theme beautifully.